Before anyone even comes on to the stage at the strangely church-yet-village-hall-style venue that is Conway Hall, in Red Lion Square, Holborn, a kind-yet-tired-looking man to my left starts telling me about his mental health. Somehow, before I’ve even had a chance to really say anything, he’s told me that he had to give up work soon after his depression diagnosis and that for him, like 25% of those prescribed pills, medication didn’t work, so he’s been trying other ways to wrestle with his own mental demons. He’s come to the talk with a group of people for whom trying to keep the black dog at bay has also seemingly become a daily struggle. 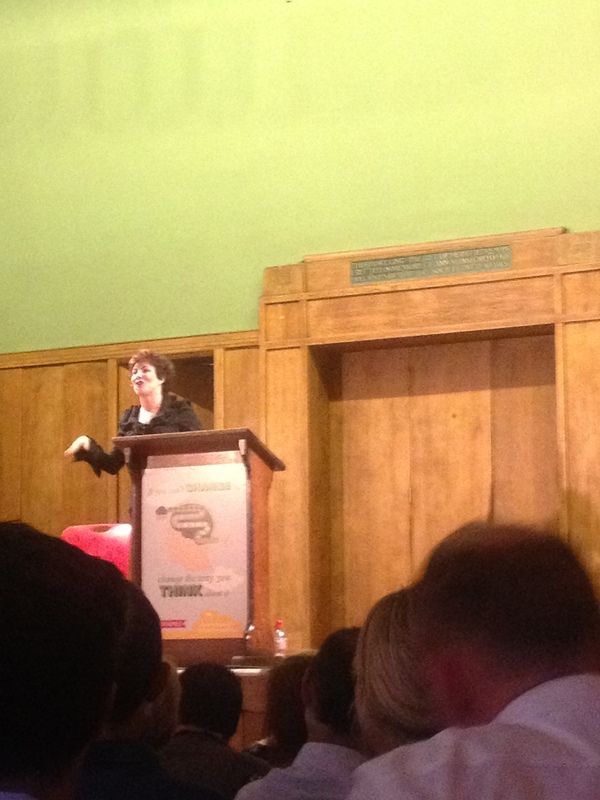 And they, and me, make up just one line of the buzzing crowd of people – men and women, from teenagers to pensioners ‒ thronging into the hall with impatience to hear famous comedian and sufferer of depression Ruby Wax speak about that recent buzz word in mental health: mindfulness. That’s what I tell the man to my left: “She’s talking about mindfulness,” I say, “It’s basically a way of focussing on the present – a bit like meditation but without the Buddhism,” I venture, sounding more confident in my definition than I feel. Mindfulness and self-awareness are the latest craze in mental health, while French philosopher Albert Camus said we must not ‘be too concerned with others’ in order to be happy. But does focusing on our own happiness mean dismissing other people in the process? A couple of days ago, Psychologies Magazine UK tweeted a quotation by the existentialist writer Albert Camus, saying “To be happy, we must not be too concerned with others.” My initial reaction to this was unsure. On the one hand, despite all his potentially depressing, aimlessly existentialist view of the world, I generally agree with much of Albert Camus’s writings, and while clearly not espousing the most extreme reductio ad absurdum elements of his stories (such as the senseless shooting in L’Etranger), I remember a sense of relief upon studying his work at school that I wasn’t the only one to think that life was ultimately without some higher purpose – although, thankfully, I have since also decided that lack of overall purpose is not tantamount to lack of meaning. In one way though, yes, in order to be happy, a certain amount of introspection is clearly needed. But a flash of memory brought that other existentialist, Jean-Paul Sartre’s ‘hell is other people’ phrase bounding around my brain with unwelcome ferocity. While sometimes appearing to be a dart of truth skewering whichever maddening crowd you happen to be sandwiched within at any given desperate moment, for me this sentence more often serves as a glowering reminder that total surrender to completely anti-social tendencies is not just remarkably unfriendly, it’s also one of the many roads towards staying-in-all day-asleep-under-your-own-black-cloud of depression. But does ‘not being concerned with others’ mean ignoring them and being unfriendly – or does it just mean focusing on yourself? Does doing the latter automatically lead to the former? Do you need to focus on yourself to the exclusion of others to truly be happy?